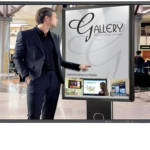 Gallery™ Digital Signage Solutions are built on the industry experience of a unique team of IT and AV professionals with individually over 25 years of experience. The products offered by Gallery™ Digital Signage are manufactured and programmed in our own factory facilities and supported by our experienced team. Our products and expert support will enhance and compliment any requirement for Digital Display systems. Gallery™ is a leader in right priced Digital Out Of Home Signage Solutions. We present strong and robust product designed to , to inform, compel and communicate at all levels.